“Stourbridge’s finest music export since the Mitre-fuelled heady days of late 80s indie-rock.” This is likely to be the first and last reference to the Neds, Stuffies or Poppies in any Kim Lowings and the Greenwood review. Seriously, any praise accrued for WILD & WICKED YOUTH is entirely warranted as this album lays out proof of an artist continuing to make significant development in the folk music world. The true worth of its value exists in the finely balanced track selection alongside the most beautiful of executions, both on a vocal and instrumental front. Clear messages are sent out that this is an album to be reckoned with as it begins life as a living and breathing entity documenting the talents of its architect. As much as folk and roots music is about preserving the past, its renewal features are just as critical especially in the shape of original composition. Perhaps the most pertinent parts of this album are the five new songs that feature thus signalling that renewal is in rude health. However, following Kim’s career over the last four years has exposed her as a dedicated folk archivist and interpreting the traditional song is set to be at the core of her creative powers long into the future. If the upward trajectory of both sides of the selection process continues in the same vein as the new album then exciting times are ensured. The album, Kim’s third full-length release, opens and closes with a new song alongside the clustering of three more originals at the core of the record. Each of these can make a valid case for standout number with maybe only a dice or daily whim making your choice. However, you can group them by style with ‘Firestone’ and ‘Fly Away’ proving exceptional piano-led pieces and immediate candidates mainly based on being the perfect vessels for Kim’s gorgeous vocals. This key attribute successfully straddles the beam between the classically cultured and the earthy warm. The resistant soul searching theme to the first of these adds to its strength, while the second acts as a resounding finale especially the iconic sampling of the old gospel favourite of the same name at the end. Lyrically, Kim appears to be at her strongest on the narration piece ‘The Tortoise and the Hare’ as cautious sentiment takes hold especially in the line ‘bide my time, see you at the finish line’. This track includes the melodeon playing of Lewis Jones, which is one of two freshly used instruments utilised well on the album and an expansion from the usual live arrangement. The other is the fiddle, liberally provided across the record by two players, Shannon Johnson and Ami Oprenova, the latter an occasional addition to the Greenwood line-up. While still on the topic of the original offerings, the spritely ‘In Spirit’ gets the album off to a stellar start. The accessible and popular beat to the song makes it the ideal conduit into the album as well as proving a well-received live number. The final self-penned track is the combined effort of an instrumental merging into a song about a positive character ‘Wyle Cop and The Wonderful Mr Clark’. The latter being an old favourite from Kim’s live show finally making its way to recorded status. While we are talking about Kim’s live shows, the Georje Holper written song ‘Away Ye Merry Lasses’ has become a firm fan favourite, probably eclipsing ‘The Begging Song’ as the number one singalong. Adding a version to the new album was a no brainer and the song, with its cover status, acts as a neat link into the traditional pieces that have made their way onto the record. Like the original songs, personal favourites from the traditional pool can vary from listen to listen. If you’re looking for an up-tempo song packed with loads of fiddle, the relentless beat to ‘The Cuckoo’ will hold sway. On the other hand, you can’t beat a good old sea shanty and a version of the popular folk song ‘Bold Riley’ makes an appearance. Both these tunes have been aired live in Kim’s shows and this should continue as the release tour gathers pace in the autumn. ‘The Newry Highwayman’ is an old song that was earmarked early on as a track to support the album and thus was launched in a lyric video. This acts as the record's penultimate track with the line ‘wild and wicked youth’ impressing enough to gravitate to album title. Earlier in the running order, we are treated to a joyful version of ‘Oyster Girl’, complete with twist. This is followed by a German translated piece titled ‘Farewell My Love So Dear’, which induces an alternative mood heavily influenced by a lengthy instrumental introduction tinged with backing vocal sounds. ‘Oh the Wind and the Rain’ completes the twelve track serving and it would be remiss for a folk album not to contain a murder ballad. At this stage, an appreciative mention is reserved for the Greenwood stalwart playing their usual superb supportive roles in the guise of Andrew Lowings (guitar, bouzouki, bodhran,backing vocals), Dave Sutherland (double bass, guitar, backing vocals) and Tim Rogers (cajon, percussion, drums). Also alongside her stellar vocals and all round creativity, there is Kim’s trademark dulcimer playing. In fact, a striking feature of this record is its high quality production value and how well the core and guest sounds have been blended. WILD & WICKED YOUTH is probably the best Kim Lowings album to date equipped to maximise inroads into a crowded market. It surely has plenty to offer folk music aficionados, but of equal importance, it reaches out beyond the core hinterlands. The inclusion of fiddle and piano make it a more rounded recording. Ultimately, it is an album to grow into as well as sitting back, singing along or just marvelling at the therapeutic nature of good music. 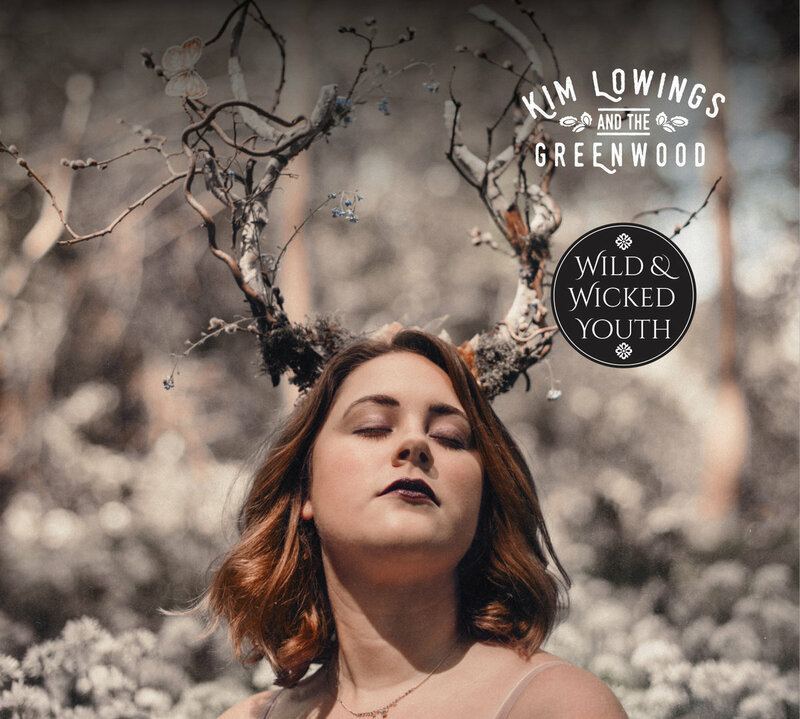 Finally, there is one difference between Kim Lowings and the Greenwood and the heady days of the Stourbridge scene: the latter faded quite quickly!